Stocks extended their “spring break”, spending a second week in a row moving sideways. This is essentially what the ADX indicator has been signaling as well (i.e. weak or flat trend). 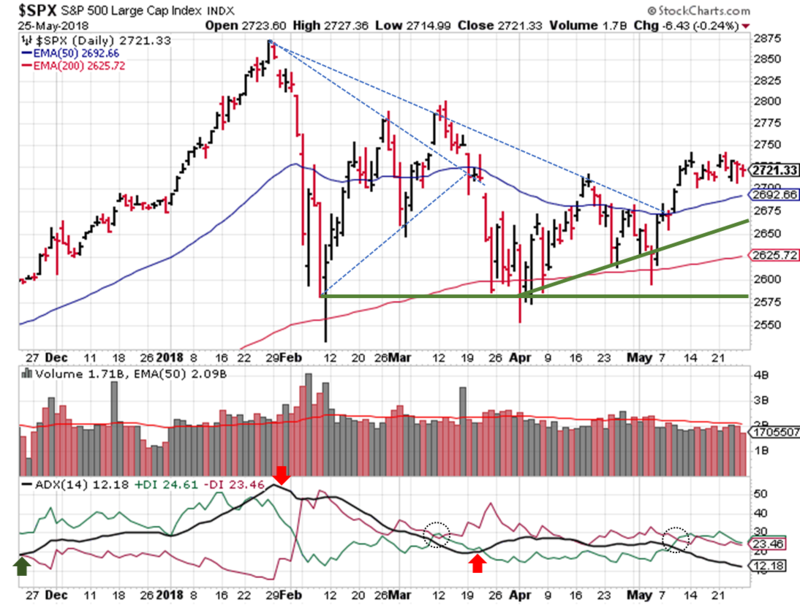 So no change in the overall signal this week, with 2 out of 3 signals showing an uptrend. 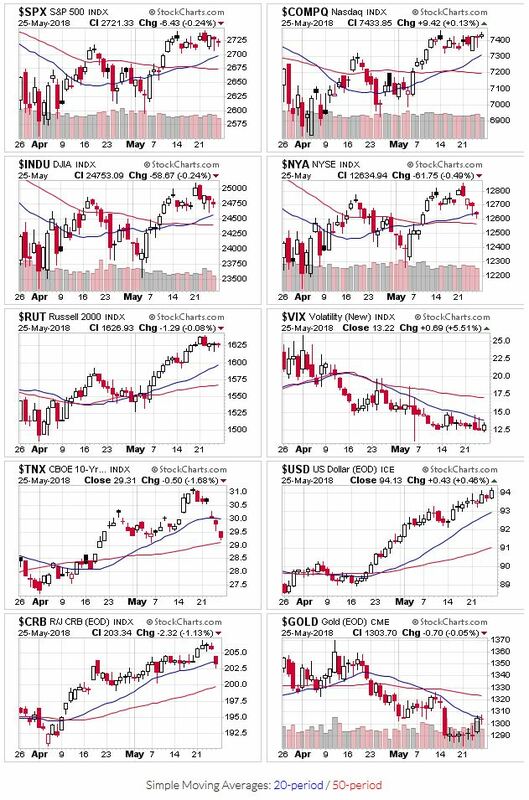 No change in the moving average signal; all the major indexes are above their 20 and 50-day moving averages. 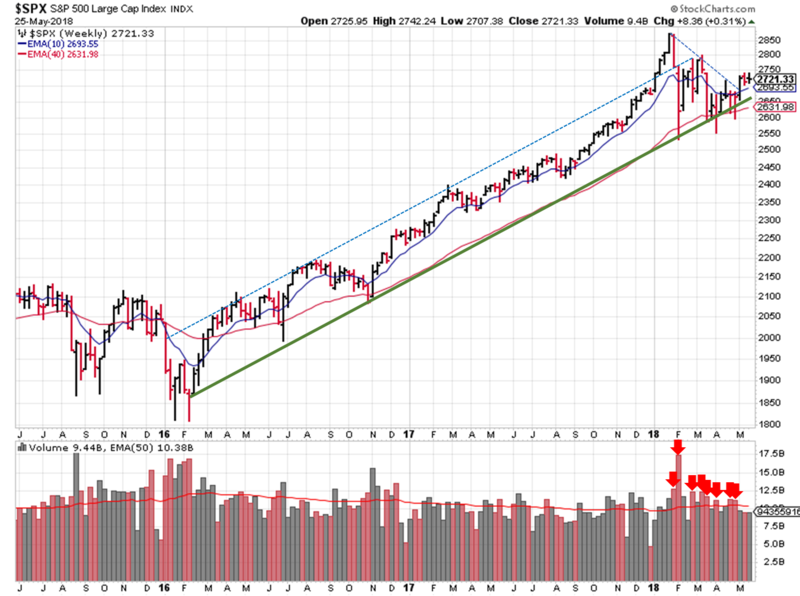 Trading volume continues to be below average, but we did see some accumulation last week…another positive sign. Objective Elliott Wave’s uptrend remains in place (Tony has been MIA due to medical issues, but always pulls through). From a long term perspective, the uptrend since our last correction remains in play (price lows in February and November 2016). On a daily view (shorter-term), the ADX weakened further over the past 5 trading sessions, and starts this week around 12. The DI+ and DI- are basically equal. So basically no trend to speak of…a traders market, if you will. During times like this, it’s best to rely on momentum indicators for your technical signals. The U.S. markets are closed tomorrow, in observance of Memorial Day, our time to remember the people who died while serving in our country in the armed forces.